When a studio announces plans to bring a video game to the big screen, I can’t help but be optimistic that the streak of mediocre and bad video game movies will end with said movie. But time and again my optimism is met with disappointment. From 1993’s Super Mario Bros to 2016’s Assassin’s Creed, we have received nothing but awful films based of video games. We can argue up and down that there are some diamonds in the rough, but the majority of these types of movies are simply not good. Sadly, Tomb Raider falls into that majority. Lara Croft (Alicia Vikander) sets out to find her father (Dominic West) who has been missing for 7 years. His disappearance leads Lara to a hidden island that holds a secret that could put the world in danger if it gets into the wrong hands. It sounds like a cookie cutter premise because it is. Tomb Raider is very generic and predictable, and it’s not because I played and completed the game, but just about every aspect of the movie follows a generic path many action/adventure movies go on. What made the Tomb Raider games interesting was the exploration of actual tombs, to solve puzzles and collect rare artifacts and to kick the asses of mercenaries, supernatural beings and the savage wildlife and we get very little of that here. There are puzzles in the movie that Lara solves, but none of them were interesting or even gave off a sense of peril. The mercenaries that hunt down Lara are just cannon fodder. The artifact that is being sought after (AKA the macguffin) is the generic “Pandora’s Box” that could bring destruction to the world. 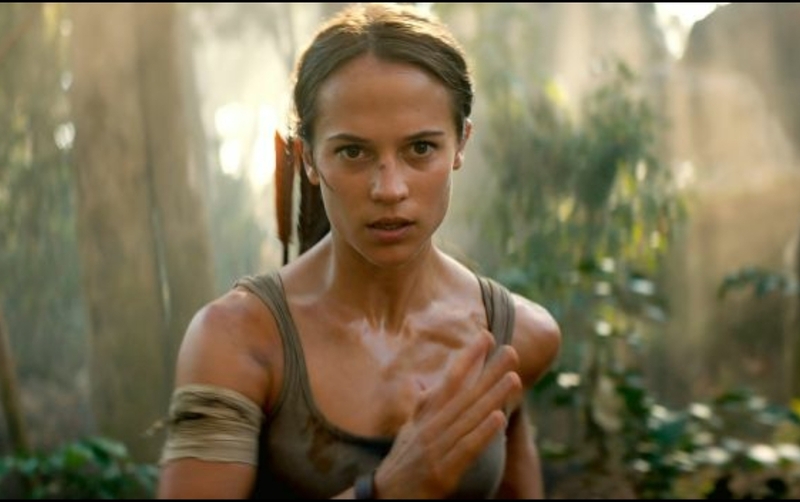 As far as performances go, Vikander as Lara is serviceable. She spends a lot of the film running. I counted probably 5 scenes where she runs from something. Rather it be gunfire or thugs attempting to steal from her, this was much more of a showcase of endurance rather than a complete showcase of everything we believed Lara Croft to be in the games. Of course, we have to disassociate the games from the film as this basically is the less interesting retelling of the rebooted game. Walton Goggins as the overseer in the hunt of said artifact is very underused. As he has played bad guys well before (the destructive and calculated Boyd Crowder in the FX series Justified), here he is very subdued. That is on the fault of the writing and not of the actor. This was a casting I was excited for but ended up being a dud. Daniel Wu plays a small sidekick role as Lara’s ride to the hidden island via boat. He has very little to do with the film other than to help Lara. My biggest gripe with the film sets up for more sequels that in turn make the Tomb Raider name useless. Without giving much away, the evil company who Lara takes on has other missions going on around the world. Rather than be the explorer or someone who looks for the thrill of hunting down priceless artifacts, Lara becomes a force of good to combat said company. It’s very much a “Fight the power” character narrative. Maybe this was done to make her different than Indiana Jones, or more relevant her male video game counterpart Nathan Drake from the Uncharted series of video games. A big positive Tomb Raider has is the perceived “Fan Service” moments that play out on screen that are pulled from the game. Who says Fan service is bad? Director Roar Uthaug does deliver in the disaster scenes that happen when Laura arrives to the island. The downside of that is just about every big moment in the movie was shown in trailers leading up to the film’s release. It has been clear as crystal that video game movies have just never worked. EVER! Compressing a story that takes place over multiple hours into 2 hours or less has been proven time and again to not work. Not to mention a direct shot for shot adaptation of any game would be problematic and would bring nothing new to the experience. Why not just dedicate a few hours to play the game and get the full experience? Play the game, skip the movie. Posted in Movies, Reviews, Video Games.